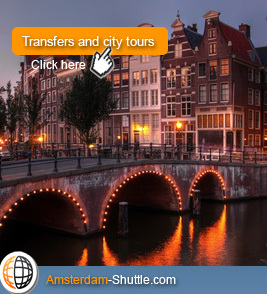 You wonder how to go from Schiphol International Airport to your hotel downtown Amsterdam ? Look no further ! We offer a professional, competent and reliable transfer service. The chauffeurs are carefully selected for their professionalism, knowledge and discretion. Please first select the airport shuttle of your choice : Shared or Private and go through the quick process. Your airport transfer will be confirmed instantaneously and you will be provided with a travel voucher to present to the driver when arriving to Schiphol. Booking your Ground transportation online is an easy way to save stress and money. Welcome to Amsterdam. Private transfer service is also operated : this exclusive service is a good bargain for groups of 4 or more. It is also the favorite of Senior citizens, travelers with heavy luggage, disabled persons, or families with small children in tow and of course travellers on duty. Thank you for visiting our site. Our service remains the easiest and most economical way to move door-to-door from Schiphol to the center of Amsterdam.